Bitesize: Global growth: The *old* normal? Two more observations stand out. First, global growth was very strong in the five years immediately before the global financial crisis, but this period was rather an exception than a rule in the past 35 years that the latest IMF dataset covers. Second, the composition of global growth has changed dramatically. 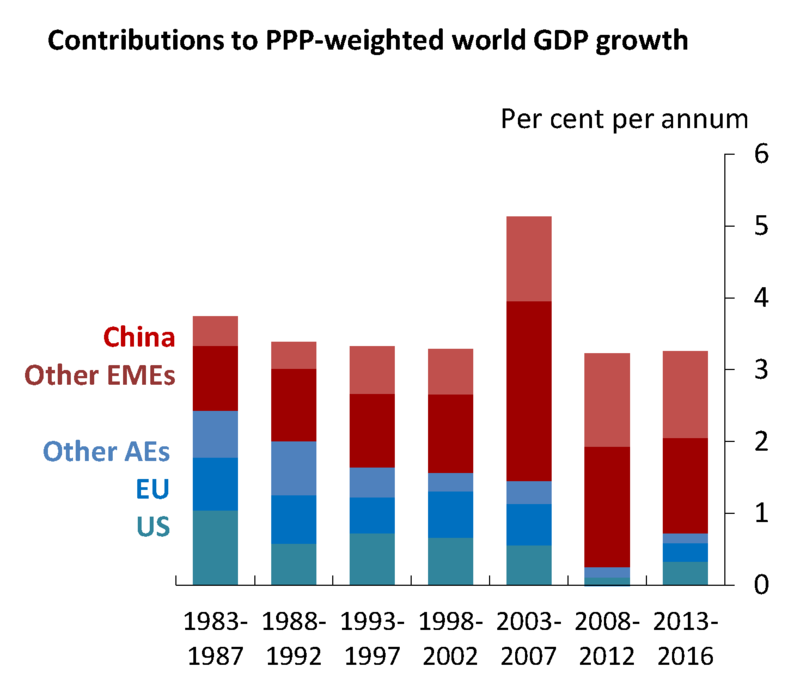 That is, while growth has been in line with historical norms globally, the contribution of advanced economies (AEs), shown in blue, has shrunk considerably; whereas the contribution of emerging market economies (EMEs) shown in red, has grown substantially. Finally, even if world GDP growth today is close to trend, it is being buttressed by unprecedented monetary policy actions. So the answer to the question of how weak global growth currently is, among other things, will depend on your view of how much stimulus the current low policy rates and other unconventional measures provide to the real economy. Alexander Naumov works in the Bank’s Global Spillovers and Interconnections Division. Yes the balance between EM growth and Developed Market growth is weighted towards the latter, but is that bad? Does ‘the West’ not benefit from growing economies fullnof new consumers? But your point on QE is important. And it’s the dollar linked EM economies who might be at risk of artificial growth here. A lot of the Growth is based on Debt and growth on Debt is not healthy. Eventually, sooner than later, we shall see this Debt issue become a major problem. Example, we see this in the Auto Industry, where companies continue to channel stuff their dealers and the dealers having a slow down in sales, even at these interest rate levels. Sub prime Auto loans are seeing issues. Housing, for all the talk and hype, has never recovered pre 2008,simple look at the charts from 2000 to 2016. We believe we are there now and the future looks grim for Real Growth. Deflation is taking hold and will takes it toll on Debt and Growth. Try correlating the trend of the wage or compensation share of GDP in the advanced consumer based economies with its growth. Start with the OPEC/Scargill/AFL-CIO induced stagflation of 1976 and the Hayekian backlash of 1980 grouping countries by their trend in workforce unionisation. Note the trend in taxation in additional demand reduction and the degree to which this was masked by consumer credit. What share would you then consider to be the sweet spot for balanced growth? Whatever name you choose for these interactions it is not ‘Globalisation’.